JNN 17 Oct 2014 Baghdad : Four car bomb attacks and a mortar strike around Shi’ite parts of northern Baghdad killed 36 people and wounded 98 within a span of two hours Thursday afternoon, police and medical officials said. 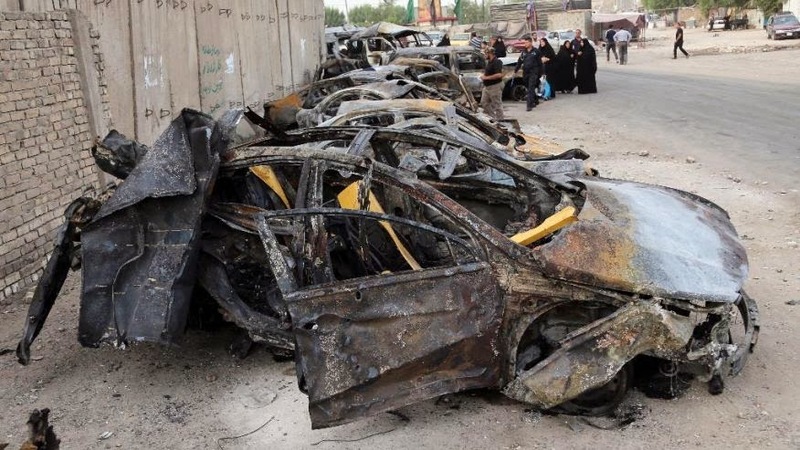 A suicide car bomb hit an army checkpoint near a restaurant in the northern district of Talibiya at 2:30 p.m., Martyring nine people; 45 minutes later, a pair of car bombs exploded in the district of al-Dawlai in western Baghdad, claiming the lives of 16 people and wounding 35 others. Minutes later, five mortar rounds hit the neighbouring Shi’ite district of al-Shaoula, Martyring another five and wounding 21 others. A final car bomb exploded in the nearby Hurriya district, leaving six Martyred and wounding 14 others. Two car bombs near the frequently targeted district of Kadhimiyah Martyred at least nine, while a suicide car bomb attack in Talbiya Martyred seven, a senior Baghdad police official said. The double car bomb attack, in a neighbourhood called Dolai, also wounded 25 people. All the victims were civilians, said a hospital source who confirmed the casualty figures. The bombing in Talbiya, near the sprawling northern neighbourhood of Sadr City, left at least 23 wounded. The United Nations said more than 1,110 people were killed in acts of violence across Iraq in September.According to an AFP count, around 400 have already been killed this month. While the bloodshed has been mainly on the frontlines where federal, Kurdish and allied forces are battling the ISIS terrorists group, blasts and violence in Baghdad continue to take a heavy toll. Antiwar has determined that at least 3,790 people were killed across Iraq during September. These numbers include militants, even foreign ones, killed in Iraq. Another 1,949 were wounded. The violence also left 126 dead and 184 wounded across Iraq on Tuesday. The number of people killed in Iraq, since the ISIL invaded in June, is impossible to accurately pin down. Various organizations have reported casualties as they occur. Only yesterday, Kurdish Peshmerga forces revealed about 200 dead and 1,000 injured during battles since early August. Terrorists deaths are just as difficult, especially those deep within ISIS/DAASH territory. During September, Antiwar.com compiled at least 1,158 civilian and security member deaths. Another 1,661 were reported wounded. These should be considered the minimum available numbers. The figures will rise as more details are received from rural areas of Iraq and those under Terrorists control. For example, a clearer, if not final, total of the number of dead in a massacre at Camp Speicher was released early in September even though the attack occurred in June. Those deaths were not included in this month’s tally. Terrorists casualties reached 2,632 dead and 288 wounded, while Iraq’s military announced that they alone conducted 2,116 sorties in September. It is difficult to gauge how accurate these casualty figures are. Peshmerga forces said they were able to take control of Rabeaa, a strategic town near the Syrian border. If Peshmerga forces retain control of the city, they will have cut off a major roadway between Syria and northern Iraq and put a stranglehold on a travel by ISIL militants between the two countries. Rabeaa was one of the first cities captured in June. Fighting there and elsewhere during the last several weeks has cost the Peshmerga forces 200 lives. Another 1,000 Peshmerga were wounded, according to Peshmerga Spokesman Hikmet Mela Ali. The number of casualties on Tuesday was not given. ISIS/DAASH Terrorists destroyed their own headquarters and checkpoints as they fled from there and Sinjar. Fighters from the Shammar Tribe helped, and the troops may have had air cover from U.S. fighter planes during the operation. British planes also bombed northwestern Iraq. Kurdish Y.P.G. forces in Syria claimed to have contributed to the operation as well. Heavy fighting also took place in Zumer, near the Mosul dam. Several villages surrounding Rabeaa have also been liberated. Three car bombs blasts killed at least 13 people and wounded 41 in Shiite-dominated neighborhoods of the Iraqi capital Baghdad Tuesday, police and hospital sources said. Today as AFP reports, ISIL Terrorists were closing on Ain al-Arab (known as Kobane in Kurdish) key Syrian town near the Turkish border, despite multiple US air strikes, as the Pentagon cautioned it “cannot bomb the militants into obscurity”. IS fighters penetrated within two to three kilometers of the Syrian town of Ain al-Arab on the Turkish border, the Observatory said. It was the closest the Terrorists had come to the town, since they began an advance nearly two weeks ago, sending tens of thousands of mostly Kurdish refugees fleeing across the border. US warplanes launched multiple strikes against ISIL Terrorist in both Syria and Iraq Tuesday, as Britain carried out its first air raids against the group. NATO member Turkey, after months of caution in the fight against IS, has decided to harden its policy, and the government asked parliament Tuesday to authorize military action against IS in Iraq and Syria. This entry was posted in Middle East and tagged Baghdad, Car Bomb Attacks, Iraq, Mortar Attacks, Shiite Neighborhood. Bookmark the permalink.